The hub appliance is required and forms the central management and reporting core of the Stratusphere platform. When I deploy the hub appliance, I typically do so using VMware Workstation and a company laptop, then I take it onsite and leave it for 30 days or so for data collection. The installation is really simple using VMware Workstation, honestly, I doubt the installation is very hard regardless of the hypervisor platform. 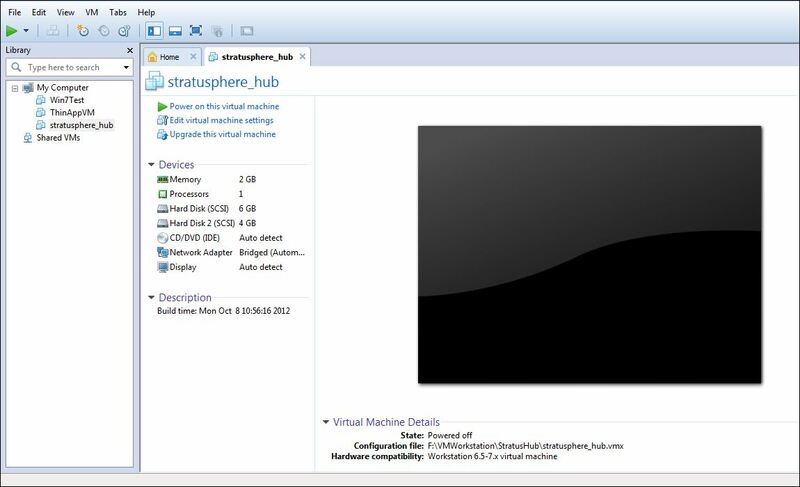 To setup the appliance using VMware Workstation, simply download the OVF template from the Liquidware Labs download site and import it into VMware Workstation. In this example, I would launch my browser and connect to https://192.168.3.212 and login using the displayed credentials. These credentials will get you into the web administration page. You can certainly login to the appliance itself, but different credentials would be required. The first thing you will be prompted to do is accept the license agreement. Click I Agree to get to the License page. On the License page, enter your name and company information. 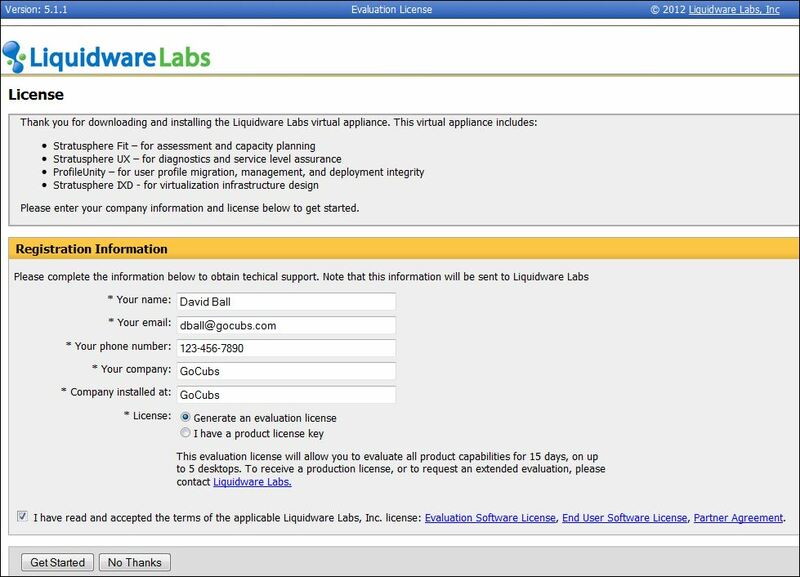 If you have obtained your Stratusphere license from Liquidware Labs you can click I have a product license key and then import the license data from LL. Otherwise, select Generate an evaluation license which will give you 5 client licenses and allow for the continuation of the installation, but get in touch with LL as soon as possible. Check the box indicating you have read the license agreement and click Get Started. Next, the Appliance Network Configuration page is displayed. Here, you set the hostname, IP address, netmask, gateway, etc. of the hub appliance. It is highly recommended that you use a static IP address. If the address of the appliance changes, data collection will be impacted. We will look at configuring the agents later and you’ll see that though changing the IP address may not be catastrophic it is inconvenient and could result in a “hole” in our data collection. 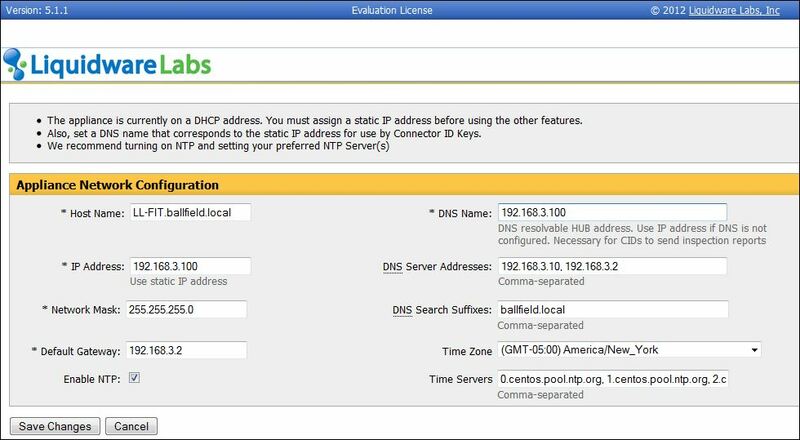 I have had customers use DHCP, but once the appliance has its address, a DHCP reservation is added using the MAC address of the hub appliance VM. Perhaps the most important setting is the DNS Name. In this case, I used the IP address of my appliance. If this value is setup incorrectly, data collection will not work. If a hostname is added within DNS Name, you must make sure that FQDN is resolvable by adding a host (A) record to your DNS lookup zones. When the appropriate settings have been entered, click Save Changes. If the IP address was changed, you will be logged out and will need to log back in. 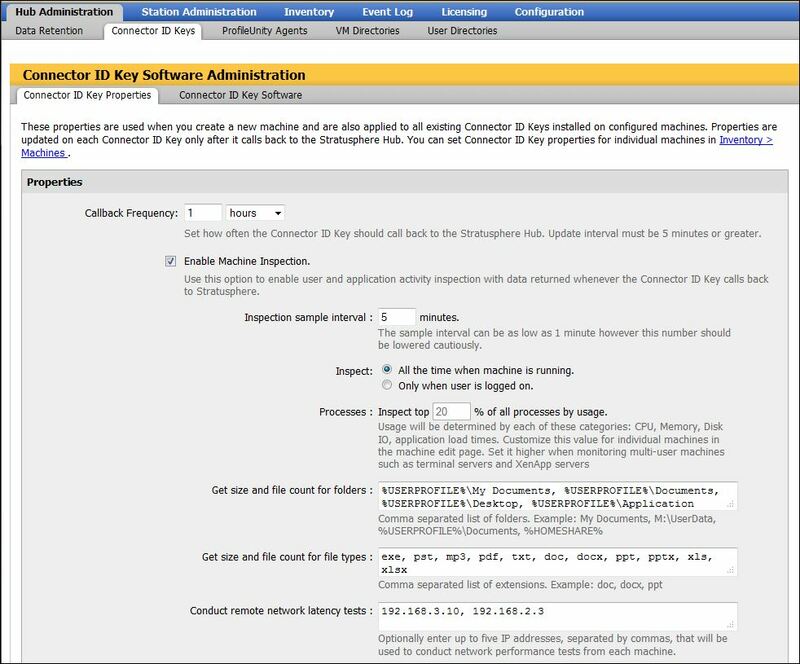 Click Hub Administration | Connector ID Keys | Connector ID Key Properties. Here, you want to set the appropriate Callback Frequency and Inspection sample interval. The defaults are 1 hour and 5 minutes. Stratusphere FIT is not a real-time data collection tool in that the agents are not continuously and actively updating clients every second they’re running. The Callback Frequency setting controls how often the agent sends it performance data to the hub appliance, the inspection sample interval controls when data is pulled from inside the client. You may also consider changing a couple settings below what is shown in the screenshot above, specifically the automatic uninstall of the agent and machine group parameters. Machine groups will be mentioned when we discuss the agents, but suffice to say, you can group like machines together using machine groups. Machine groups are typically created based on location or department, or maybe a combination of both. The automatic uninstall of the agent is a nice feature decreasing the burden on an administrator to ensure the agents are removed when no longer needed. That’s really it in regards to a high-level overview of installing and configuring the hub appliance. The next post will be client deployment options.